Shopping for Star Trek Vehicles? Explore the early days of the Federation! The Enterprise NX-01 from the Star Trek TV series. Features updated paint, lights, sound effects, and dialogue! 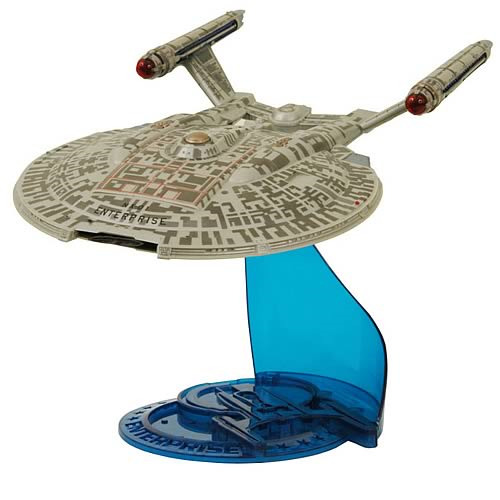 The 12-inch long ship includes a display base. Explore the early days of the Federation in the Star Trek TV series Enterprise with this Star Trek Enterprise NX-01 Vehicle! The U.S.S. Enterprise NX-01 has received a full overhaul, with updated paint, lights, sound effects, and dialogue featuring Captain Archer straight from the show! The press of a button triggers the electronic features as the 12-inch long plastic ship rests atop its plastic display base. Packaged in a full-color window box with try-me feature.